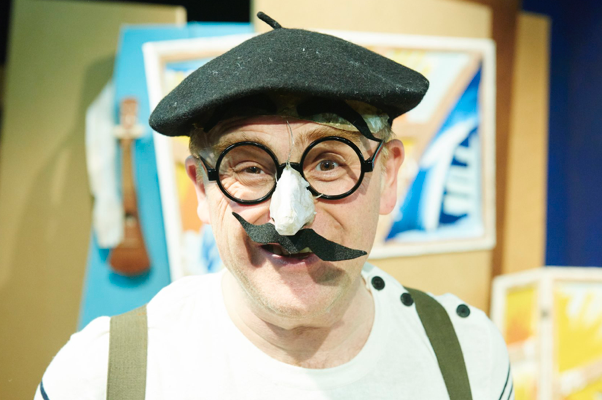 This week we’ve kicked off our tour of The Boy Who Bit Picasso at a school in Leamington Spa through the capable hands of Warwick Arts Centre. WAC have created an impressive season of shows, workshops and creation sessions aimed specifically at keeping creative learning in Primary schools. I’m by no means an expert in this field, but it’s clear that schools really struggle with this, and programmes like the one we’re connected with should be applauded. Clapham Terrace Primary hosted our show for 3 days and welcomed visiting pupils from the town, as we performed for a range of ages from year 1 to 4. We were really pleased to have parents and governors in attendance as so much of the show has intergenerational appeal. Jon ‘Ed’ Morris, our old friend and new Picasso did a grand job, despite not being a ukelele player and having the wrong chords at the start of a 3 day rehearsal! A real pro. Jon is a Coventry boy and as we chatted with Warwick Arts Centre’s Education Director, Brian Bishop, it became clear that the show Jon cites as a formative experience on his road to becoming an actor was created and performed by Brian. Brian spent a good few years working with Belgrade Theatre’s Theatre in Education department, and as Jon described one particular role that had an impact on him, it turned out it was Brian’s! At the time Jon was being advised his best career prospects were to join the army and see the world (via Belfast or Bosnia). There’s something really moving about the fact that, with Jon, we’ll be encouraging the creative spirit for schools and young audiences over the next few months, he’s testament to the philosophy that arts in education really does change lives and contributes in a positive way to our society.